iPhone 6 or iPhone 5S in September 2013? Apple fans are waiting to see the Apple’s new device. 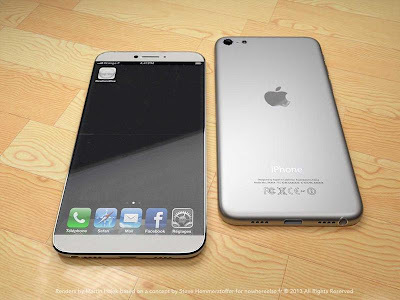 Some rumours speak about the iPhone 6 other about the iPhone 5S. Samsungs Galaxy S4 has newer hardware specifications as the current iPhone and Apple is under pressure to launch something big. The Screen size of the iPhone 6 will be increased once more. It will be a 4.8 Retina+ sharp IGZA display with 1080p HD resolution. The display will go from edge to edge. Because of the edge to edge design the well known home button available since the first generation iPhone will disappear. It is more or less clear that apple will bring a update on the processor as well. The current dual core process will be replaced by a quad-core A7 chip. Apple will build in the latest communication standards such as 802.11ac wi-fi connectivity. In addition Apple will introduce a wireless charger. It is clear that the new iPhone will run iOS 7 with the new design. Storage capacity will be doubled to 128 GB storage capacity. the new device will be released in the last 2 weeks of September this year. The question is if Google will bring their latest Android version including new Nexus devices within the same time span.